I am also implementing what I learned from the last attempts in the hopes that it will produce the paste-y texture I seek! I boiled the pears until they were just soft enough to be mashed, hoping this would keep any excess water from them. I then strained them, put them back into the pan, and mashed them. Last time, I let the apples sit in the strainer for about 5 minutes while I used the back of a spoon to press any excess moisture from them. This time, I did that several times to make sure I get all the water out that I could. 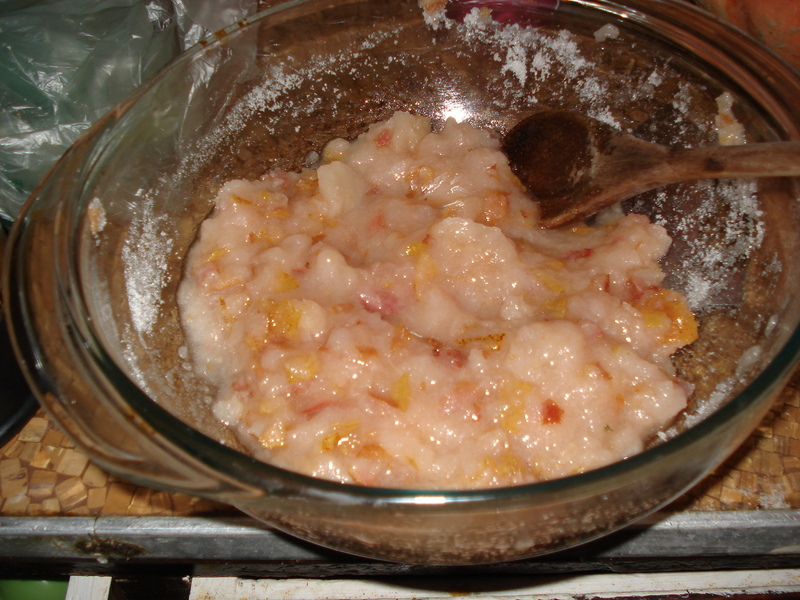 I measured out equal weights of sugar and fruit pulp and combined them, but ran into the same problem I ran into with the apple paste, where the sugar would start dissolving right away (see photo below). Pear soup, even after adding 2 cups of sugar. I thought I would have to scrap this recipe, until it occurred to me that I could have just put all this fruit in the food processor from the beginning, and that would make a much finer fruit pulp than I would be able to do by hand with a plastic potato masher. I put the sugary pears into the food processor, then strained them again (bringing me down to about 1/4-1/3 cup of pear pulp). I added more sugar along with the ginger, cinnamon, and rose water, and it seemed like it *might* be turning into paste. Sugar still dissolved, but it dissolved less, and I was able to get it into the mold well enough. The last time I did this, I tried to bake the paste very slowly, and discovered that all it did was make a sugary soup in my oven which was very unpleasant to clean. To avoid a repeat performance, I baked it in the mold (it was still a little too soft to just shape in the mold and then bake) on high to see if that would help. The answer is: no, it does not. Still got the same bubbly soup. It confirms my suspicions that the pears and apples we find commonly today are just not close enough to reproduce this recipe. You’ll notice that Historic Food’s Quince Recipe page has these decorative pastes made from quinces, so it may be that I would need to use those. The quince paste is also very thin, and I was unable to get either the pear or apple pastes to be wafer-thin in my pan. After three tries, I think it’s safe to say that fruit pastes and I are not going to meeting again anytime soon, so I’ll be moving on in the coming weeks to try other recipes. Sorry Markham. 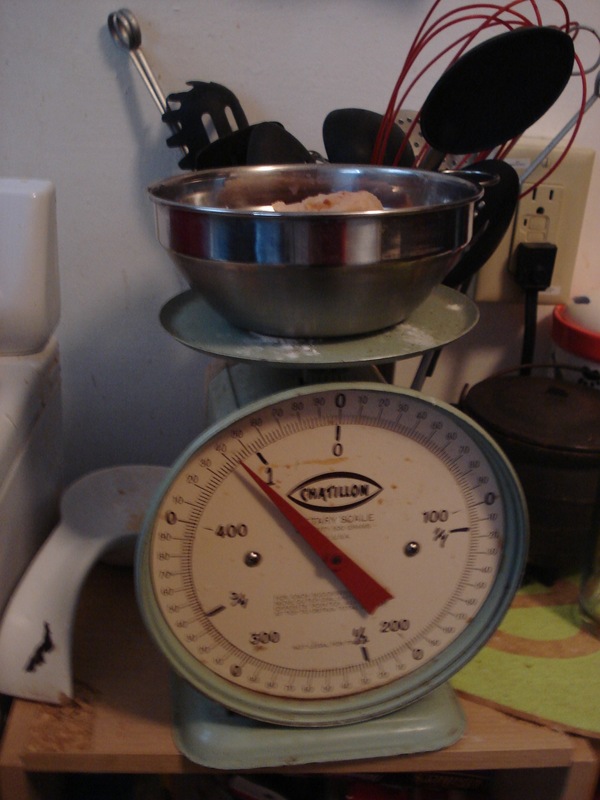 Weighing out fruit pulp on the kitchen scale. Julia – I’m no expert in 17th century cooking, but I have made a few fruit recipes… I don’t think that your problem is the modern fruit varieties, except maybe that all the apples in today’s markets are sweet (historically most all apples only suitable for cider, not sweet). Maybe try a more tart apple and instead of chopping and boiling them in water and then trying to drain them, try chopping the apples/pears and slowly bringing them to a boil without adding any liquids to the pot. They should be able to boil in their own juices. Then when they are very soft, you can beat them in the pot you cooked them in and add the sugar. Once the sugar is dissolved/melted, add the spices, and use the rose water to get it to the desired consistency? I am picturing a process that would be similar to making a very thick, sticky apple butter. If it was thick enough (perhaps cooked longer), you could mold it. Am I terribly off? Thinking a bit more about this – your “pear soup” looks kind of chunky – perhaps if it were cooked longer, it will get much smoother. Looking at the recipe on Historic Food’s quince page, it looks like the quinces should be boiled for a very long time. To go from a quart of water plus 8 quinces, to a pint total, the fruit would have to be boiled for a looong time. That is reduced more than half, especially since the fruit will release a lot of liquid. You could try peeling the fruit first as well. However, from the Historic Food’s recipe, the peels would come out in the jelly bag. It also sounds like once the fruit/water has been boiled down to less than half, the rosewater and sugar is added until it gets to a gelling point (“then take a drop, and drop it on the bottome of a sawcer” sounds like testing for the right gelling point), which I imagine is very thick. So thick that when the fruit/sugar/rose water reduction is cooled, it totally gels. ???? Perhaps you’re right–I had taken the pear recipe and boiled it for less time after boiling the apples for a long period and having trouble with them. Maybe the trick is to boil them without added liquid, or to boil them for as long as I would for making jam. Definitely something good to try!